I thought I would never find the city I love more than Tokyo. Not until I visited Osaka and Kyoto. Oh I'm literally falling in love with those cities - to everything they have: the city, the transportation system, the ambiance, the culture, the sightseeing, the hospitality of the people, and of course: FOOD! Because I'm a foodzilla, hahaha. Choose how you want to see Osaka and Kyoto. Do you want to see it covered with beautiful cherry blossom? Then you should come in April (early April is the best, I heard), but of course it will be packed with people. Or, do you want to see it in the most dramatic red scenery? Then you should come in November. Do you want to see their castles covered in snow? Then come on winter. What about other months? Don't worry, you can still see the beauty of Osaka and Kyoto. I, myself, visited on the early May. I didn't get to see the cherry blossom, but the weather is the most perfect for me. Not too cold, not too hot. I only have to bring jacket for the night (the wind is still pretty strong at night). There are a lot of options for accommodation in Osaka and Kyoto; from hotel, apartment, or even tradition guest house. I rented an apartment room in Osaka by Airbnb. I decided not to move my accommodation when visiting Kyoto because I spent more time in Osaka and also, Kyoto can be reached with couple hours train ride from Osaka. I brag over and over again about my apartment in Osaka. With only USD 35 per night, I got more than what I could expect. My apartment was small but I got everything I needed. It was like a student apartment with one tatami room (fit perfectly for 2 fluffy futon beds), a kitchen, and bathroom (with bathtub! wohoo!). The most important thing is the location! Only ONE minute walk from Taisho station and train to airport stops at Taisho station too! Downstairs, there is an izakaya (bar) which open until midnight for my late night hungry stomach. The host even gave me bicycle and pocket wifi to use. How cool is that! Click here to view my apartment in Osaka. Haruka express train: this is the fastest way to reach the city. Haruka express train will stop directly at Tennoji, Shin-Osaka, and Kyoto station. Please be noted that Shin-Osaka is not Osaka Station. So you need to continue with Osaka loop line train to reach Osaka station. Check this link to find out about Haruka special package for foreigner. JR Kansai Airport rapid service: this is the train that I took to my place. Since my place is only a minute walk from Taisho station and this train stop at Taisho station, so this is the most convenient way for me. If you want to take this train to the airport, please always check with the station officer as some train are combined with train to Wakayama. From my experience, my train from car 1-4 went to Kansai Airport and car 5-8 went to Wakayama. And be careful to take this train on rush hour as the train will be also packed with people who go to work or school. JR Kansai Airport Rapid Train. Oh, meet my Dad! Nankai rapid service: another rapid service train but different train company. IC Card or Tourist Pass? This really depends on your trip. If you pack your itinerary with a lot of tourist destinations, I suggest you to take one of the tourist pass available. For my previous trip, I didn't use tourist pass. I used ICOCA (the IC Card) because I didn't plan to take too many tourism destinations. I only visit two places in one day, so that I didn't rush to go to other places and could enjoy more time in every place. If you're in Kyoto and plan to take bus everywhere you go, I suggest you to get the bus pass because it's cheaper. Me? I'm a train mania, hahaha. I only took a bus once to Kinkakuji temple. So, I didn't buy the pass. Once again, make a good calculation of your trip cost before deciding to buy the pass. Sometimes using normal ICOCA is cheaper. Check this link for more info. 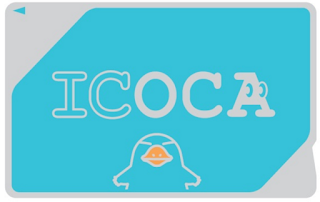 Oh, you can buy ICOCA from the ticket machine in many JR stations and ICOCA also can be used in Tokyo. If you've been to Japan, you must know that taxi can cost you a lot. Like A LOT. Try their public transportation, it's very convenience. Don't be panicked if you see a train route map with a lot of lines. Use Hyperdia and you don't have to read the whole map. This is crucial for your trip, hahaha. Hyperdia is your life savior if you plan to take public transportation around Japan. It not only can tell you what to ride, but it can also calculate your cost, time of trip, and tell you when the next train is coming. Accurate. Super, super accurate. And Google Maps can navigate your way, especially if you're walking to a specific location. But this means you have to get an internet connection. I know some of you maybe prefer a really low budget traveling. But I think to get an internet connection should be on your list. Whether you choose a roaming package, buy a local SIM card, or pocket wifi. I was so lucky, my host provide me a pocket wifi. But if you don't, you can get your SIM Card or pocket wifi when you arrive at Kansai airport. You can even pre-book it before arriving, so that your pocket wifi or SIM card can be sent to your hotel, like Sakura Mobile's services. Osaka and Kyoto are well-known for their tasty food. I've proved it. I went to a random cheap restaurant many time and never was disappointed with their food. They always take care of their good quality food and the cleanness of their restaurant. People said you should try okonomiyaki and takoyaki when you were in Osaka. Try it! Or, you can walk through Dotonbori area where you can find various selection of food along the street. Special note if you're Muslim, always ask before eating because some of their food ingredient use pork. Pork in Japanese is butaniku. You can visit Kuromon market also, as they sell many fresh seafood and meat which you can eat raw or cooked in BBQ style. I love that market! I will write about it in my next post. Osaka and Kyoto have a lot of amazing spot to visit. But what if you only have few days there? Below is a must-to-visit checklist I made for you. Remember, my preference might be different than yours. Osaka Castle (Osaka-jo): you don't leave Osaka before visiting the castle. If you don't want to pay the admission, you can walk around the park and still get the view of the castle. On that time, I arrived too late that the castle was already closed. But I still can get the beautiful iconic picture of it. How to get there: take JR Osaka Loop Line train to Osakajokoen station. The castle's park is just in front of the exit gate. See? I still manage to get this beautiful shot without going inside the castle! Dotonburi & Shinsaibashi: shop til drop in Shinsaibashi and eat til drop in Dotonburi (both are in one area). A lot of shops in Shinsaibashi is tax free, so it has pretty good price after tax refund. The street is always packed with people, either tourist or local. Especially in weekend when many Osaka teenagers will be hanging out there. I went there on Saturday night. Even though many shops were already closed, but as the night is getting late, seems like more local teenagers went there to hangout. How to get there: take subway to Shinsaibashi or Namba station. Kuromon Market: imagine fresh seafood in low price. Oh, I can't stop eating there, from scallops, abalone, baby octopus, salmon, tuna belly, everythiiiing. You can buy it raw or ask them to grill it or even in sushi style. Not just seafood, some shops also sell souvenirs. I bought some tea leaves for my family there. How to get there: take subway to Nipponbashi station, take exit 2 and cross 2 crossroads. You will see the market. Umeda Sky Building: You can view the whole Osaka city from here. This is also can be a romantic place at night as the floor will be glow in the dark. I didn't get to visit it because it was raining, so I can't tell you much about it. Kyoto Station: the station itself is an attraction. The architecture of the station will amaze you. You can also see the sky garden of the top of the building. There are also many souvenir shops there. Arashiyama: Arashiyama is the place where you can find the famous bamboo forest. You can hike and enjoy the scenery while visiting some temples along your way. You can also take the Torokko train which will take you on the side of the hill where you can see another beautiful scenery. Arashiyama's best view is on autumn when all the leaves will be turning red. The place will be packed with people on the weekend, holiday, cherry blossom or autumn season. How to get there: take JR train from Kyoto Station to Saga Arashiyama Station. Kinkakuji: Kinkakuji or the golden pavilion. Like its name, Kinkakuji will serve you a beautiful golden temple. Please pay attention to its opening hour as you won't get anything if you pass the opening hour. How to get there: Kyoto bus 205 to Kinkakuji-michi. Or in my case when I came from Arashiyama, I took JR train to Enmachi Station then Kyoto Bus 205 to Kinkakuji-michi. The golden pavilion. Is it really made of gold? Fushimi-Inari: You must have seen the famous red-orange-ish gates like below picture. It is located in Fushimi-Inari Shrine. You can climb the stairs surrounded by the gates. But that's not the end of the story. When you return, take right at the exit gate and you will see a street full with street snack! How to get there: Take JR train from Kyoto Station to Inari station. Still half way to go! Kiyomizudera: kiyomizudera is a huge temple which will stole your breath especially in cherry blossom season and autumn. When you walk down the temple, you will find Higashiyama district where many shops sell local souvenir. You can also continue your trip to Gion area. How to get there: take bus nomor 100 or 206 from Kyoto station, stop at Kiyomizhu-michi or Gojo-zaka. Or in my case, I came from Fushimi inari, I took Keihan train from Fushimi Inari Keihan Station to Kiyomizu-Gojo station. I will write separate articles about places above (except Umeda Sky Building) where you can see more detail about each attraction and of course more photos. Many people don't speak English there, even though you are in a fancy western coffee shop. So, some basic Japanese language will help you. like: thank you (arigatou gozaimasu), sorry (gomenasai), excuse me (sumimasen). If you use android smartphone, JED dictionary should be in your phone. This is not a big thing to consider, but come on. You are already in Japan, wearing kimono is a fun thing to try. Especially in Kyoto, visiting a temple with kimono is really common, even for local people. You will see a group of local teenager wearing kimono to visit a temple. So, don't be shy if you want to try wearing it. I got 3,000 yen for kimono rental and extra 1,500 yen for the hairstyle (exclude tax). You can choose a higher price package for more choices and more premium kimono. I got a nice color of kimono! So spring! There are many shops selling local souvenir around tourism attraction places. But if you missed it, you can buy some local snacks and sweets in Osaka Station, Kyoto Station, or even Kansai Airport. I found many snacks from all over Kansai area in Kansai Airport with reasonable price. It even open in the morning. Drop a comment if you want to know more about my trip to Osaka-Kyoto. See you in my next post!